When one thinks of oil wells, particularly those of the "Oil Gusher" type, he usually thinks of Texas, Oklahoma, or the Gulf of Mexico. 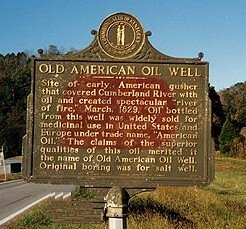 Actually, however, the first oil discovered in this country and maybe the first well of gusher type in the entire world was in Burkesville, Cumberland County, Kentucky. Here is the incredible story of that discovery. When the settlers of Kentucky's salt supply ran out, they went to the known"licks", nearby salt springs, for re-supply. It was needed for two functions, to flavor food and, more importantly as a preservative to combat decay. ended up in Pittsburgh, Pennsylvania. 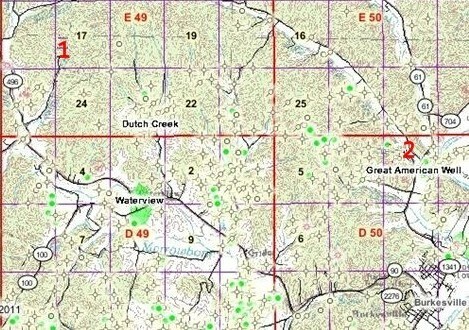 producing wells between #1 and #2.